The new models of the Cruise 4.0 have been improved to meet the demanding challenges of everyday commercial use; making them ready to take on the harshest environmental conditions, for example with dinghies and sailboats up to 4 tons. This makes the Cruise even more rugged in the event that it runs aground and even better protected against corrosion when used extensively in salt water. The Cruise 4.0 is comparable to a 8 HP petrol outboard and can be easily mounted on your boat with a couple of tools, regardless of whether the remote or tiller version. A power supply from at least two lithium batteries (Power 26-104) or with lead batteries (lead-gel or AGM) must be provided for operation. 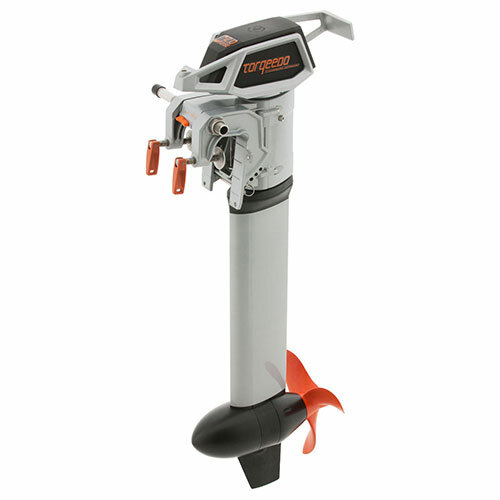 High-efficiency outboard with 4,000 W input power, equivalent to a 8 HP petrol outboard. All Cruise models are suitable for inflatables and other small boats. We recommend the Cruise 4.0 for dinghies and sailboats up to to 4 tons. Remote steering connector option, comes with remote throttle. Lubricant-free polymer plain bearings protect against damage from fishing lines or debris and provide improved mechanical support for propeller shaft – wear-resistant and maintenance-free. Comprehensive galvanic corrosion protection through careful matching of all materials and meticulous isolation of materials with different electrochemical properties. Everything is waterproof to IP67. Available with short or long shaft – as you need. * Depends on type of boat, load, propeller and conditions. Speed and range indications do not represent a legal guarantee. For a displacement boat making way through the water, the required propulsive power increases in proportion to the cube of the speed. This means that if you want to double your speed, you need eight times as much power. And vice-versa, a small reduction in speed is enough to increase the achievable range substantially. The Torqeedo Cruise's on-board computer calculates the remaining range constantly, by linking the motor's consumption data with the charging level of the batteries, and the speed over the ground from the GPS. This allows you to read the remaining range in real time from the motor display or the smartphone app TorqTrac. * Torqeedo static thrust measurement is based on internationally accepted ISO standards. Static thrust figures for conventional trolling motors are typically measured differently, which results in higher values. To compare Torqeedo static thrust data with conventional trolling motors, add approximately 50% to the Torqeedo static thrust values. Which Cruise for which boat? For dinghies and sailboats up to 3 tons, we recommend the Cruise 2.0. The Cruise 4.0 easily propels up to 4 tons. Is the on-board computer compatible with my lead batteries? If the Cruise is operated with lead batteries the charge status indicator (and with it the remaining range indicator) is based on estimates derived from battery information entered during initial motor setup. What are the advantages of the Power 48-5000 lithium battery for the Cruise? As a lithium battery, the Power 48-5000 provides far greater performance with lower weight than conventional lead batteries. In other words, it does not weigh down your boat unnecessarily – and you benefit in terms of range and power. Additionally, the integrated battery electronics of the Power 48-5000 are designed to communicate with the on-board computer, meaning that the values provided by the battery such as remaining range and capacity are always exact. What does the on-board computer do? The on-board computer, which is integrated in the remote throttle with the Cruise R and in the tiller with the Cruise T, analyses information from the motor and combines it with GPS data. Motor consumption and GPS speed are always exact. When the Cruise is operated with the Power 48-5000, the information on the battery and on range with remaining capacity is also exact because both products communicate with each other. That is very convenient. What requirements must my boat meet for twin motors – the Twin Cruise? The tie bar is used to connect the two Cruise outboards to the same steering mechanism. What is the warranty on the Cruise? The Cruise models have 2-year warranty from the date of purchase for non-commercial use. Did we leave anything unanswered?